QUICK!! 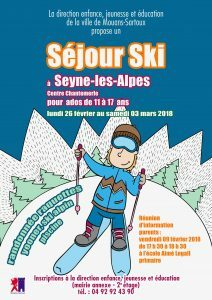 There are still places for the Ski Trip for Teens to Seyne-les-Alpes during the February school holidays. It is for 11-17 year old and organised by the town of Mouans-Sartoux. They will be doing snow shoeing, alpine skiing, seated sking and there is also the chance to go to the swimming pool. There is a parent information evening about the trip tomorrow night – Friday the 9th of February from 5:30pm to 6:30pm at L’école Aimé Legall Primaire. For information and to sign up your kids call the team at “La direction enfance, jeunesse et éducation” on 04 92 92 43 90.